Kilmore is a town in Victoria, Australia, 60 km north of Melbourne via the Hume Freeway and the Northern Highway and is 370 metres above sea level. In 1841 a land speculator, William Rutledge bought an estate of 21 square kilometres and named it for his birthplace, Kilmore, in County Cavan, Ireland. 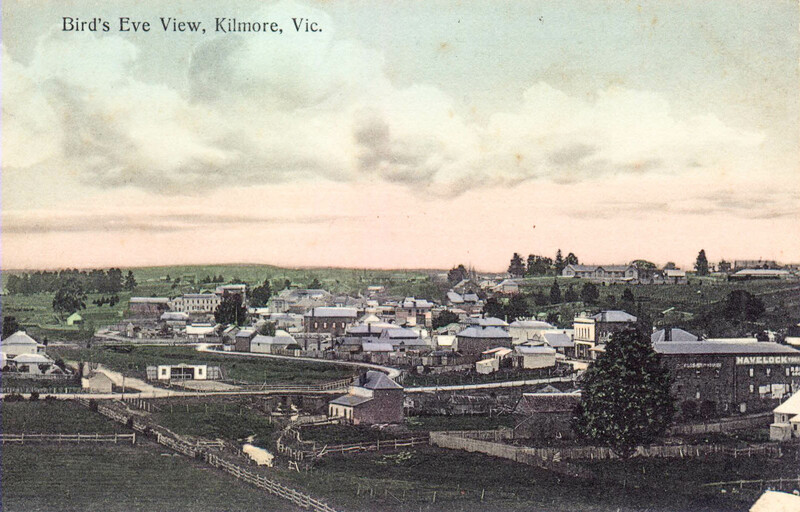 Kilmore is the oldest inland town in Victoria and was a convenient stop over for many during the Victorian gold rush of the 1850s. Data is most welcome to be submitted for inclusion here – Births and Marriages up to 1920 and Deaths till present day. If you have a Kilmore connection please let us know by emailing your data to us. It would be appreciated if you sent the required information as displayed in the relevant pages. If some details (e.g. parents’ names) are unknown, please indicate this. Are you aware of the archeological diggings underway on the Brewery hill site? I believe they will end this week. Yes, the archaeologist has looked at records held by our Society and is to prepare a report for Heritage Victoria.